This was one of the stranger postgame interviews in a while. After the New England Patriots won Super Bowl LIII 13-3 over the Los Angeles Rams Sunday, CBS’ postgame ceremony coverage went off the rails very quickly. Jim Nantz tried to throw it down to sideline reporter Tracy Wolfson for an interview with Patriots’ quarterback Tom Brady, but Brady shrugged her off to exchange hugs with a couple of Rams’ players, then teammate Julian Edelman. And then there was a giant crush of people, a lot of yelling, a “Jesus, are you okay? !”, and other weirdness before Wolfson finally got to do her interview. It became a pretty standard interview from there, but it certainly was an unusual way to get to that point. 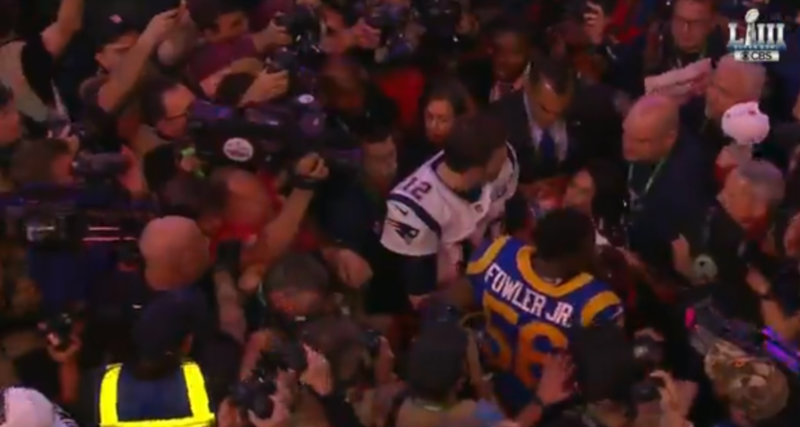 It’s unclear exactly what happened here and why so many people were allowed to get in so close to Brady during this attempted interview, but it definitely was an odd broadcasting moment.